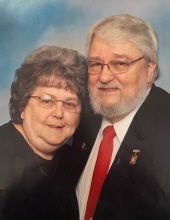 Duane A. Sparks, age 80, a lifetime resident of Lapeer, passed away in the comforts of his home on April 4, 2019.Duane was born in Flint, MI on June 10, 1938. He retired form General Motors Buick Division after 30+ years of loyal employment. Duane was a proud member of the Lapeer Masonic Lodge, the Lapeer Oddfellows and the Attica Muzzleloaders. He enjoyed many years of bowling on multiple leagues at Gerlach's and his "Old-Timers" golf league. Duane was a great story teller and an amazing father and grandfather. Duane is survived by his children: Becky Sparks, Vicky (Chris) Boger, Suzanne Bruce, and Joan (Kevin) Carty; 14 grandchildren; 21 great grandchildren; 2 great-great grandchildren; daughter-in-law Sharon Sparks. Duane was preceded in death by his wife of 35 years, Janet Sparks; sons Michael Sparks, Charles Machiela Jr., and David Sparks; grandson Harley Bruce. Friends may visit with the Sparks family on Sunday, April 7th from 5 to 8 PM and on Monday, April 8th from 11 AM to 1 PM with a funeral service immediately following at 1 PM at Lynch & Sons Funeral Directors - Capstick Chapel in Lapeer. Pastor Dan Burger will officiate. Memorials to the American Cancer Society are appreciated. "Email Address" would like to share the life celebration of Duane A. Sparks. Click on the "link" to go to share a favorite memory or leave a condolence message for the family.